Blenheim Town Hall is located at 1848 State Route 30, North Blenheim NY 12131; phone: 518-827-6115. Photo: Lansing Manor House, ca, 1819, Blenheim, Schoharie County, NY. 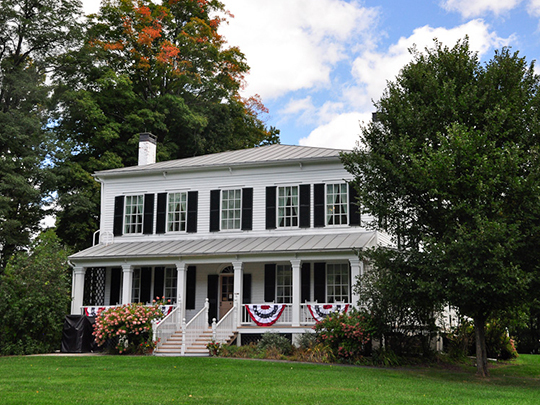 Built by John Lansing, Jr. for his daughter and son-in-law, Jacob Livingston Sutherland. Listed on the National Register of Historic Places in 1973. Photographed by User:Thomas L. Hayward (own work), 2010, [cc-by-3.0 (creativecommons.org/licenses/by/3.0)], via Wikimedia Commons, accessed February, 2014. Blenheim, named from the Blenheim Patent, a part of which lies in the north part of town, was formed from Schoharie, March 17, 1797. Jefferson was taken off in 1803 and a part of Gilboa in 1848. Schoharie Creek flows north through the east part, receiving Westkill and several smaller streams from the west. The first settlements were made by the Dutch and Palatinates, previous to 1761, but many of them were driven out during the Revolution. Among the early settlers were General Freegift Patchin, Lawrence Mattice, Henry Effner, Henry and Jacob Hager, Lambert Sternberg, William Freeck, Isaac Smith, Banks Morehouse and George Martin. Many of the early settlers were soldiers of the Revolution. Daniel Hager and Philip Bartholomew were captains in the war of 1812.